Food allergen immunotherapy may benefit from adjunct therapies to enhance safety and efficacy. We review preclinical studies investigating the effects of probiotics and other microbial-based interventions on oral tolerance, describe the human clinical trial evidence thus far for microbial adjuncts, and discuss steps for translating research findings in this area to clinical therapy. Murine studies support that microbial-based interventions confer protection against sensitization and may augment treatment efficacy for food allergy. Microbial adjunct therapies can promote regulatory T cells and modulate Th1 vs. Th2 responses. There is a wide array of novel modalities utilizing microbial components. Ongoing efforts are focused on translating preclinical data into potential treatments. 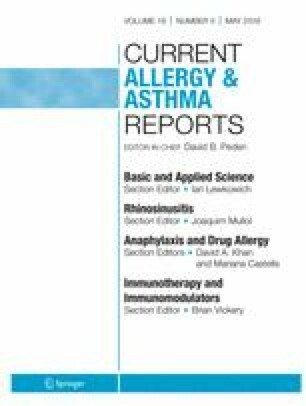 Probiotics, prebiotics, and microbial components have all been examined as microbial adjunct therapies in murine models of food allergy. The effects of probiotics appear to be strain-specific. Prebiotics and bacterial components are innovative modalities to modulate oral tolerance. Better characterization of dysbiosis in human cohorts with food allergy, deeper mechanistic understanding of microbial adjunct therapies, safety evaluation, and careful clinical trial design will be crucial for the development of microbial adjuncts for food allergen immunotherapy. Microbial adjunct therapies have the potential to enhance the efficacy, safety, and durability of food allergen immunotherapy. Dr. Bunyavanich reports grants from the National Institutes of Health, during the conduct of the study. Dr. Hsi-en Ho declares no conflicts of interest relevant to this manuscript.